CSA and we also carry Full Belly whole wheat flour and wheat berries. I haven’t made a wheat berry salad in years, but I figured I would just treat it like farro. I didn’t know that it would be better than farro. Wheat berries stay firm and have a pleasant little pop when you bite into them. While farro is delicious in salads, it sometimes can get a little mushy. And when you consider that wheat berries=local and farro=Italy, it makes sense to go with the old standby instead of the trendy import. I soaked the wheat berries all day and then cooked them for about 45 minutes. 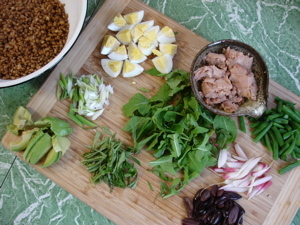 I drained, then tossed them while warm with all the fixings you see here: oil-packed tuna, avocado, green beans, green onions, arugula, basil, radishes, hard-boiled egg, kalamata olives, and a simple mustard, lemon, sherry-shallot vinaigrette—a Nicoise of sorts. The leftovers made a fantastic lunch the next day. I think I’ll be making this a lot and varying the ingredients by the season. I can imagine cherry tomatoes, feta, and corn. Or, beets, goat cheese, and toasted walnuts. Or cubed roasted squash and slivered fennel. You get the picture. This entry was posted in healthy. Bookmark the permalink. Post a comment or leave a trackback: Trackback URL. 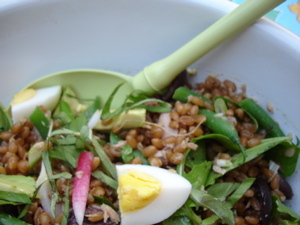 I’ve found wheatberries and farro to be pretty similar too. And after all they really are the same thing, just different varieties of wheat. Farro shouldn’t be mushy though. It may just need either less cooking or more careful handling. Some farros really benefit from an overnight soak, and then a very gentle simmer, though this seems to vary by farro. Farro itself can be quite diverse since there are a really diverse varieties of hierloom strains grown throughout Italy (and other countries as well…dinkle from German speaking countries is the same beast also). You can get some domestic farros too (Anson Mills has some nice ones), but wheatberries are generally cheaper. Thanks for stopping by. Never heard of dinkle. Interesting. I’ve heard of one domestic grower in Montana (I think). Good to know of the Anson Mills brand.